Appareo is a suspended luminaire with a seemingly invisible light source. Its name, from Latin’s “ad” (towards) and “pāreō” (be visible), refers to the simple yet elusive qualities of light. By treating light as a raw material, we created a product with both presence and absence – basically, a little piece of magic. Most LED lighting solutions place a strong emphasis on the light source. With Appareo, we wanted to make it invisible, focusing on the visual experience rather than on the technology behind it. Intended for contemporary office environments, Appareo needed to provide high-level illumination that was easy on the eye, energy-smart and ergonomic. In creating the slender aluminium frame, we took our design cue from the wing of a bird, with its light, strong form and amazing thinness. A slightly slanted surface added a little body. Light-intensive units can be unnecessarily blinding. We used a specially treated acrylic screen that reflected and diffused light from the diodes surrounding it. This allowed for steady, comfortable lighting while creating an intriguing visual experience. Appareo combines uncompromising design with high-quality light, great ergonomics and efficient energy consumption. Today, it comes in two versions – rectangular for task lighting, circular for ambience lighting. However, the enormous potential of LED technology opens up for further product development. Light is binary. Either you see it, or you don’t. 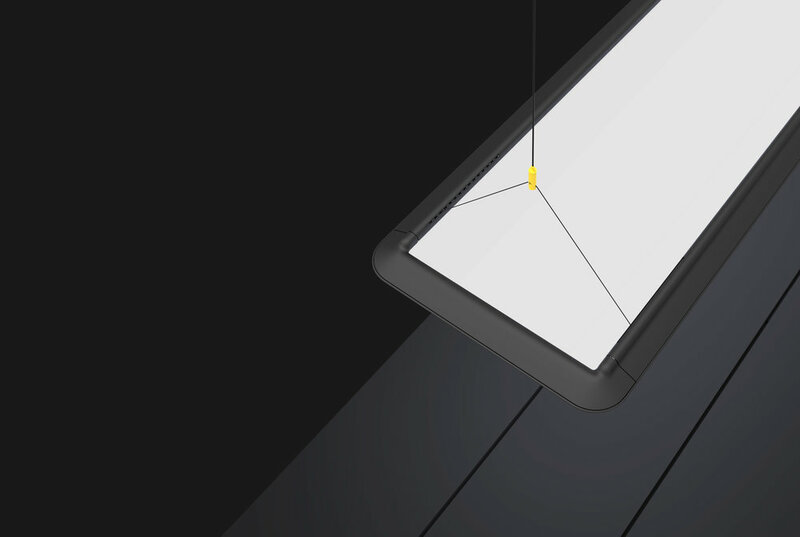 With the flick of a switch, the unique transparent screen becomes the light source itself. Diodes line the edges of the frame, projecting light into the prismatic screen, which acts as both a reflector and a diffusor. A bird’s wing provided the ultimate design inspiration for the light, strong aluminium frame, further enhancing the visual illusion. Fagerhult develops, produces and markets professional lighting solutions for public environments. Since 1945 they have united a passion for light with functional Scandinavian design. With a long-term focus on energy efficiency, via intelligent lighting controls and advanced LED technology, they aim to contribute to a lasting, light-loving world.